Bangalore: French cement maker Vicat SA has bought a 51% stake in Hyderabad’s Bharathi Cement Corp. Ltd, promoted by Y.S. Jagan Mohan Reddy, a Congress legislator and son of former Andhra Pradesh chief minister Y.S. Rajasekhara Reddy. Vicat, in a statement on Monday announcing the stake purchase, did not disclose the deal price. M. Ravinder Reddy, director, marketing, Bharathi Cement, too, refused to name the price. He, however, said recent deals involving other Indian cement firms had been struck at $230 (Rs10,235) per tonne of capacity. Bharathi expects to have a?capacity to produce 5 million tonnes (mt) of cement by the end of this year. He added that the firm had been “looking for a global partner both for technology and getting a pan-India footprint". DNA newspaper on Friday first reported on a likely deal between Vicat and Bharathi. Reddy refused to say if Jagan Reddy had diluted his holding in the company or if Bharathi’s management would be changed post the acquisition. “It is for the acquirer to decide," he said. Bharathi in October commissioned a 2.5 mt capacity plant in Andhra Pradesh’s Kadapa district with an investment of Rs700 crore. The second phase of the plant expansion, with an additional investment of Rs720 crore for another 2.5 mt capacity, would be completed by December, Reddy said. He added that all the investments required, including loan disbursals from banks, “have already happened". The Kadapa project has a debt component of Rs1,000 crore. In India, Vicat already has a 51:49 joint venture with Sagar Cements Ltd to build a 5.5 mt, $625 million cement plant at Gulbarga in Karnataka. “We do not see the (Bharathi) deal as a move against our interests," said S. Sreekanth Reddy, managing director of Sagar Cements. A spokesperson for Vicat said the Bharathi deal would not interfere with its joint venture with Sagar. “The acquisition of Bharathi by Vicat will, in fact, act as complementary to our operations since there is no overlap of markets between the Vicat-Sagar joint venture and Bharathi Cement," said Sreekanth Reddy. The first phase of the Sagar-Vicat project, with a capacity of 2.75 mt, is scheduled for commercial production by January 2012. Vicat also holds a 6.6% stake in Sagar. “In fact, it was RV Consulting Ltd, a Sagar group company, which facilitated the acquisition of Bharathi by Vicat," said a senior official at Sagar Cements, who did not want to be named as he is not authorized to speak with the media. RV Consulting had built the Kadapa unit of Bharathi, he added. “When Vicat approached the Sagar group, where it already has investments, for scouting cement units for acquisition, RV Consulting suggested Bharathi, as they had built it," he said. 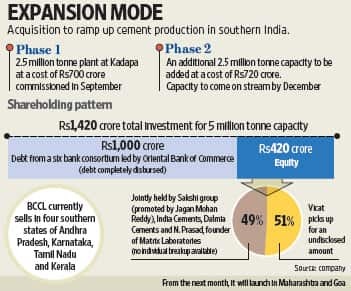 An analyst tracking the cement industry for an Indian brokerage said Vicat will have a 10 mt cement-making capacity in south India, making it the fastest capacity ramp-up from a low base by any cement manufacturer in India. Meanwhile,?Nimmagadda Prasad, founder of drug firm Matrix Laboratories and minority stakeholder in Bharathi, said he was exitng from the company by selling his stake. In a 16 April report, Angel Securities Ltd had estimated cement industry production in 2009-10 at 201 mt. It said cement prices in southern India had increased by Rs20-25 per bag of 50kg each in spite of sluggish demand because of production cuts in Andhra Pradesh due to power shortages. Cement dispatches had grown by 8.3% in March over the year-ago period.